IROCKER CRUISER Inflatable Stand Up Paddle Board 10'6 Long 33" Wide 6" Thick SUP. Our main goal is an excelent servise. We are doing our best to make our buyers happy and satisfied with their orders. Not all paddle boards are created equal. IROCKER is at the very top in quality boards in the industry. IROCKER uses only the highest quality Quad Layer military grade PVC in their inflatable paddle boards. New for 2018 QUAD LAYER PVC provides extra protection and helps to reduce flex over common single and double layer boards on the market. Maximum protection provided by the QUAD LAYER equals increased durability and rigidity for the rider. New for 2018 the crocodile diamond textured deck traction pad keeps you on your feet and in position while riding. It can be stored in the closet or trunk of your car and easily checked at the airport when travelling. BOARD DIMENSIONS: Fully Inflated 10'6" Long 33" Wide 6" Thick Rolled Up 36" Wide 15 Diameter Weight 25 lbs. PRODUCT MATERIALS: QUAD (4) LAYER Military Grade PVC with a High Density Drop Stitch Core makes this board built to withstand impacts from dings, rocks, concrete and wood pilings. PADDLE: High Quality Fiberglass FLOATING Paddle New for 2018 longer adjustment from 72 to 86 inches allowing you to select the length most comfortable for your perfect stroke. HAND PUMP: Ultra Efficient 24 Selectable High Pressure High Capacity Dual Action Hand Pump with Integrated Pressure Gauge. BACK PACK: iROCKER carry bag backpack with adjustable shoulder straps so your trunk doesn't get wet, sandy, or muddy from your paddling adventures. REPAIR KIT: Valve Wrench in the rare occasion that the inflation valve becomes loose and needs tightening and 2 repair patches. We offer only the highest quality products and stand behind them 100%. EXTREMELY STABLE, iROCKER CRUISER INFLATABLE PADDLE BOARD: 10'6" Long 33" Wide 6 Thick - Board Weight 25 lbs Weight Limit of up to 400 lbs. 33' Wide throughout the entire board with an extra wide tail makes for extra stability while the shape of the board still allows for a smooth tracking experience. Similar to a hard board when fully inflated to 15 PSI but only half the weight. Super Durable, no longer a need to worry about damaging your board when banging against debris while on the water. HIGH QUALITY ADJUSTABLE FIBERGLASS PADDLE: New LONGER adjustment for 2018 Floating fiberglass paddle, half the weight of a standard aluminum paddles designed to help you enjoy your paddle session. Edges of the blade constructed of a TVR rubber material so don't worry about chipping your blade. Breaks down into 3 separate pieces in order to easily fit into your provided bag. THE ULTRA LIGHT 37 oz. DUAL ACTION HIGH CAPACITY HAND PUMP by iROCKER: The dual action high capacity hand pump makes inflating your paddle board a breeze. Switching from dual action to single action makes the pump much more efficient than the standard single action hand pumps. Use the dual action mode to push air into the board on the up and down stroke when pumping. Switch to single action when the PSI begins to increase to make pumping much easier at high pressure. BACK PACK CARRY BAG by iROCKER: Most comfortable iSUP bag on the market. No need to worry about how you are going to carry your board from the car to the water to begin your SUP adventure. Your iROCKER SUP and all the accessories fit into the provided back pack with ease, there's even room to spare for extra gear. Padded adjustable shoulder straps and waist support. Also equipped with inner stabilizing board strap and outer clinching straps to keep your board from shifting inside the bag. You're covered on everything outside of normal wear and tear for 2 years. 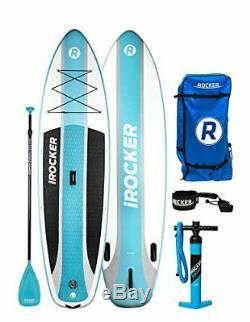 IROCKER offers only the highest quality inflatable paddle boards constructed of the highest quality materials. We stand behind our products 100%. Beware of low cost and or light weight thin single layer construction boards. With iROCKER you can expect your board to outlast the rest. We do not accept P.
BOXES - PLEASE PROVIDE A PHYSICAL ADDRESS. &###xA0;We advise you to use a reputable carrier service when returning your goods. The item "IROCKER CRUISER Inflatable Stand Up Paddle Board 10'6 Long 33 Wide 6 Thick SUP" is in sale since Monday, May 14, 2018. This item is in the category "Books\Magazine Back Issues". The seller is "colombonach" and is located in US. This item can be shipped worldwide.